AdonisJs is a Node.js web framework with a breath of fresh air and drizzle of elegant syntax on top of it. We prefer developer joy and stability over anything else. 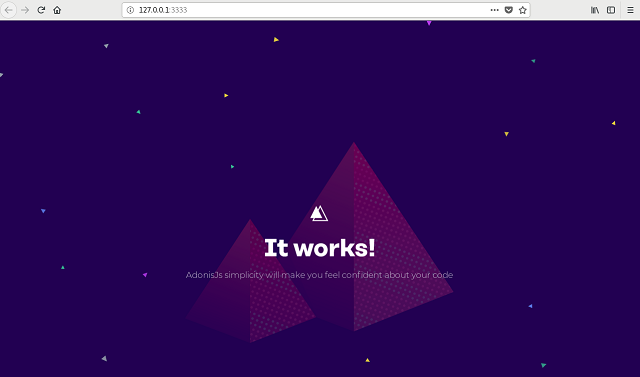 I tested today this web framework named AdonisJs with Fedora 28. The main goal was to use MySQL with MariaDB from Fedora 28 distro. | routes for different URL's and bind Controller actions to them. | A complete guide on routing is available here. This is telling Adonis that when the root of the site is loaded, render a template/view called welcome. That welcome template can be found in /resources/views/welcome.edge. For example, if you change into start/routes.js from welcome to index then you need to rename the welcome.edge to index.edge . Using the mysql database is simple. Into Fedora 28 distro you can use mariadb, let's install it. You need to make changes into .env file into your project folder. Let's test migration command for files to allow you to create and delete tables. Now that our database and tables have been created, I can create a model for handling jobs table and associated data.